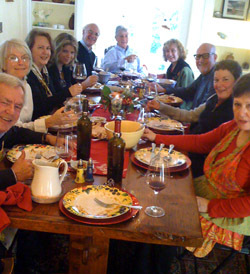 Thanksgiving week is a wonderful week for those of us who love wine. For this special holiday I like to share great wines from my cellar with my guest at our Sandwich bed and breakfast. This is a time to be thankful and a time to share, both of which I had the opportunity to do this year. As a lead into the holiday, my friends at the Cellar 55 Wine Merchants hosted their annual in cellar tasting on Tuesday night. As always, they selected excellent wines to share that they felt would enhance the meal. I had the pleasure of tasting wonderful wines from Napa Valley, France and Argentina. From around the world, a wide selection of great wines is available at the Cellar to help you enjoy your holiday. Yes, this is research and work for me. On Wednesday before Thanksgiving, the Belfry Bistro sponsored a very special wine tasting. All proceeds from the tasting went to benefit the non-profit R.I.S.E. Worldwide. R.I.S.E.’s mission is ‘to be a catalyst to education, entrepreneurship, and generational change within insolvent communities’ by developing community centers in Tanzania, Africa. Chris Wilson’s son Alex is the founder and driving force behind this endeavor. Chris, and all of us who attended, had a chance to be thankful for what we have in America and share with others across the world. And we also tasted some great wines, including a 2008 Peter Michael La Carriere Chardonnay, and a 2008 ZD Point Noir. A chance to ‘do good’ and have a great time, another reason to love wine. On the big day, we had our traditional dinner at the Inn with guests and friends. As you might expect, our friends enjoy wine as much as we do and I am thankful that Jan’s best friend Donna from Napa Valley also graciously shared some wine from her cellar with us. To kick off our festivities, we started with a 2008 Far Niente Chardonnay and a very unique 2008 En Route Point Noir from Donna’s cellar. 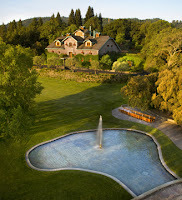 Far Niente in Oakville is a magnificent estate that we had the pleasure of visiting a few years ago that is best known for its classic Napa Valley Chardonnay and Cabernet. 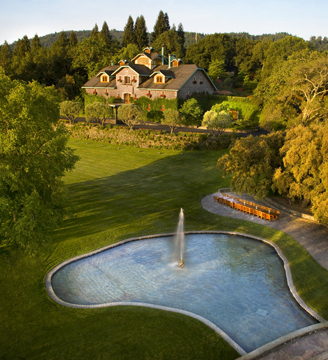 The same Far Niente partners created En Route in the Russian River Valley to focus on the best Point Noir. With the heaping amounts of turkey and dressing and more sides than you can image, we served two Zinfandels from my Cellar, a 2005 Downing Family Zinfandel and the 2008 Papapietro Perry Zinfandel. California Zin is a versatile wine that can perfectly compliment the wide range of flavors of a traditional Thanksgiving Day dinner. I think these two, although different in style and location, Downing in Napa and Papapietro in Sonoma, each added to the bounty of food we shared. As we lingered over our pumpkin, apple, pecan, lemon meringue, mixed berry, and sour cherry pies, and more wine, we were all thankful to be together. Next year plan to join us for this great day of celebration at our Sandwich bed and breakfast, just miles from where they held the first Thanksgiving in 1620. Sandwich is also a great place to visit over the Christmas Holidays, we are open and would offer a warm Sandwich welcome, and a bit of wine.